It's a sad day for the Philippine movie industry when online piracy scores a victory and prevents a Filipino film from being shown abroad. That's exactly what happened to the critically-acclaimed blockbuster movie,"Imagine You and Me" (IYAM), starring the phenomenal AlDub love team composed of Alden Richards and Maine Mendoza. 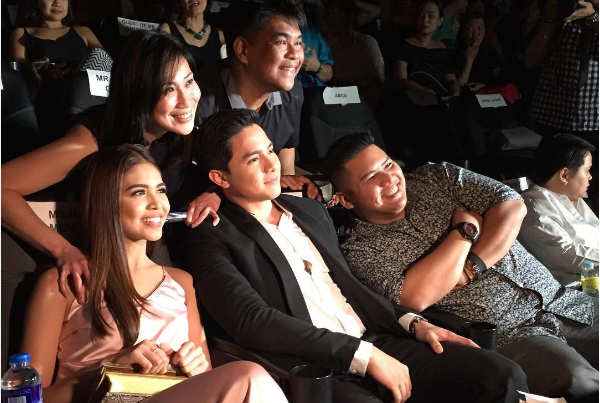 The film's director, Michael Tuviera, announced in a series of tweets that IYAM will not be shown in Florida because the film is being shared online illegally on Facebook and YouTube. Tuviera said that they were negotiating the screening of the film in that specific territory when the illegal or pirated uploads happened. 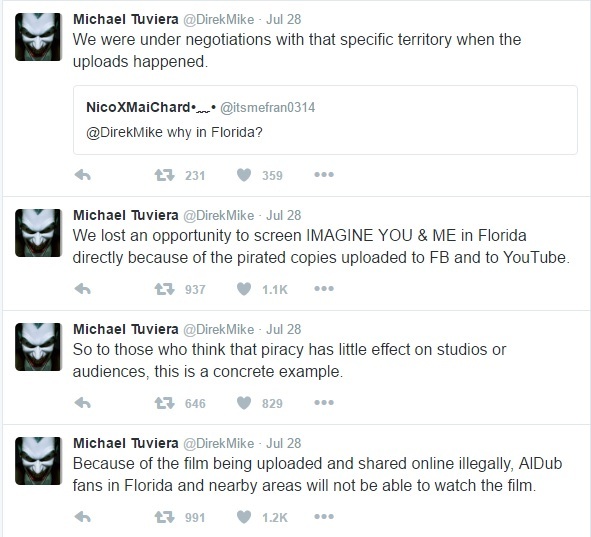 Because of the film being uploaded and shared online illegally, AlDub fans in Florida and nearby areas will not be able to watch the film. So those who think that piracy has little effect on studios or audiences, this is a concrete example. As early as July 22, or 9 days after the film was shown in theaters, Tuviera asked his followers not to support piracy because it is stealing, "pure and simple", and notes how piracy harms the Filipino film industry. If piracy keeps stealing from the industry, soon there will be no Filipino Film industry to speak of. Imagine You and Me was and is still being shown in theaters outside of the Philippines, especially in countries with high numbers of OFWs including USA, UK, Italy, Canada, Hong Kong, Singapore, United Arab Emirates, Australia, and New Zealand. Given a B grade by the Cinema Evaluation Board of the Philippines, IYAM grossed over P21.5 million on its first day, the highest opening gross so far, for Filipino films in 2016. As of July 17, 2016, the film has reportedly reached P120 million in ticket sales, according to the source of pep.ph. Producers of the film, namely APT Entertainment, M-Zet Productions, and GMA Films refuse to give exact figures as to how much IYAM has earned to date. Now on its third week and still going strong, it would not be surprising if the producers come out with a ballpark figure of P400 million gross earnings for the film.